For the third time since 2014, Alec Bradley introduces a special, limited edition variety of their world-renowned Nica Puro cigar blend. Story goes, when Alan Rubin (Alec Bradley founder and brand owner) encountered the torcedores at the Plasencia factory in Estelí, Nicaragua displaying a strange bunching technique known as the “accordion method,” he incorporated this into a new cigar and re-termed it “Diamond.” This technique differs from the more common “book” style of bunching, with each leaf folded in half and stacked n a wave-like pattern; the end result resembles either an accordion or diamond… depending on your creative outlook. 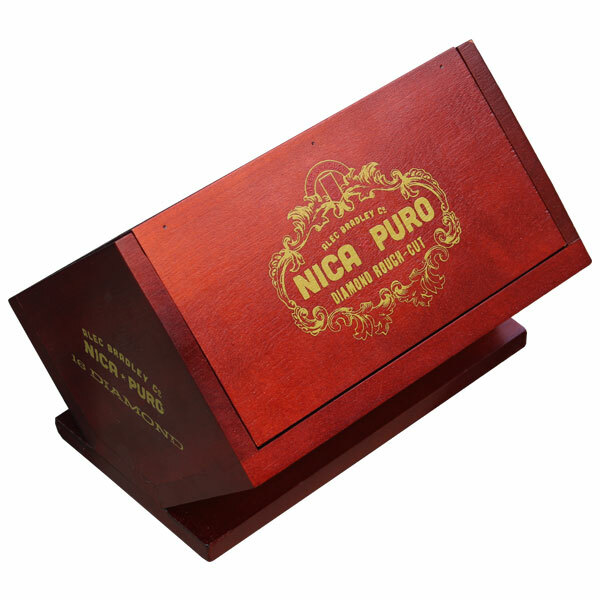 With an all-Nicaraguan wrapper, binder, and filler, Nica Puro Diamond Rough-Cut offers a medium to full body and rich notes of earth, espresso, cocoa powder, and good jolt of crushed black pepper. Experience this specially crafted cigar while supplies last, as only 1,500 boxes have been made!